The ruthless, methodical intelligence for which Skullgrin is known is only a front. Inside him rages the spark of a mad beast, straining to break free. He rarely engages in combat, so afraid is he that the heat of battle will drive him into a frenzy from which he will never emerge. Though he is a Decepticon, he still fears the destruction of which he's capable. Skullgrin is an odd choice for a Generations toy. The character isn't particularly popular, and as a Pretender it's no mean feat to actually make a toy that looks like him. Unlike Thunderwing or Bludgeon, the other two Pretenders who've gotten some attention lately, Skullgrin is a redeco of an existing toy. He shares a mold with Darkmount, the toy designed after the big, bulky Marvel comic villain Straxus. That actually turns out to be serendipitous, because Skullgrin's Pretender shell was big and bulky too. And while this new Skullgrin is more "stocky robot with a vaguely skull-like head" than it is "giant hulking hell-beast with a goat-skull for a face", there really aren't a lot of existing Transformers who would even come close to fitting in Straxus's body. As strange as the concept sounded at first, it's actually not a bad idea. Whether it works or not is a different question entirely. As a redeco of Straxus, Skullgrin transforms into a half-track mobile artillery vehicle. But where Straxus was mostly blue, Skullgrin has a more realistic colour scheme made up of light grey, dark charcoal grey and white. He has a few maroon highlights, along with a small number of silver and gold paint apps, but for the most part he looks like he could be a real military vehicle. The only real sign that he's more than he appears is the pale gold Decepticon symbol painted to the side of his cockpit. Skullgrin has a fully-functional turret that spins 360 degrees without anything getting in the way, as well as a cannon barrel that can elevate about 45 degrees or aim downwards about ten degrees. The turret itself is a bit large though, because it transforms into his robot-mode legs. It's actually a tad wider than the vehicle it rests on, making Skullgrin look a bit awkward compared to more proportional armoured vehicles like Bludgeon or Breacher. Like a lot of newer figures, Skullgrin comes with three small clip-on weapons that can attach to any of nine or ten different mounting points all over his body. On Straxus, his brighter colour palate made them seem a bit cartoony. But Skullgrin's charcoal-grey weapons work nicely as a part of his more realistic scheme. And if you decide you don't like them, you can remove them and give them to any of the dozens of figures released in the last year that are equipped to use them. Conversely, if it's your thing you can load Skullgrin up with half a dozen extra weapons and turn him into a rolling gunnery platform. The clip-on weapons are one of my favourite gimmicks from recent toylines because they add a lot of play value without detracting from the toy's transformation or posability...and if you don't like them, you can leave them off entirely without losing anything important. Skullgrin has a secondary alt-mode as well. With a little bit of fiddling, his vehicle mode becomes a vague approximation of an artillery platform. When I reviewed Straxus, I treated this mode with contempt and basically pretended it didn't exist. However, since then I've realized that the platform is exactly the right size to be used as a gun emplacement by Scout-class Transformers, right down to the pair of handholds that flip out from the back of the turret to let the smaller robot point and shoot. It's still a silly mode that doesn't really look like anything, but it's got more play value than I gave it credit for originally. All in all, Skullgrin is a very nice vehicle. He's also a vehicle that looks absolutely nothing like the original Skullgrin, in any way, shape or form. 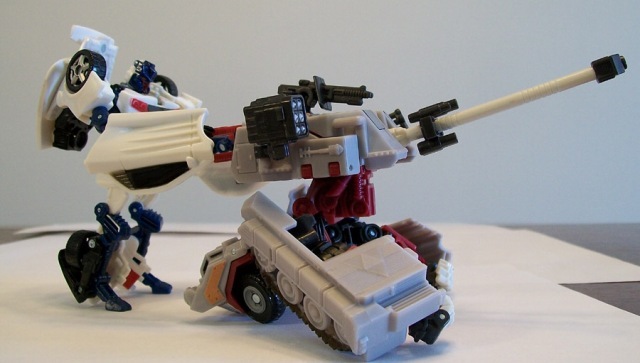 Now, that's not entirely a bad thing -- the original Skullgrin's vehicle mode was a robot doing yoga, with treads and guns slapped on -- but this guy definately won't strike the same nostalgic chord that Bludgeon or Thunderwing will. There have been a fair number of smaller-than-usual Deluxe-size Transformers in the last few years, something that has become strikingly clear as toys like Generations Thunderwing and Reveal the Shield Optimus Prime have come out in short order. Skullgrin, however, is proof positive that big Deluxes aren't a think of the past just yet. He's tall, broad-shouldered and bulky, and seems even more so compared to some of the less-impressive figures who share his price point. Skullgrin is one of the best redecos I've seen in a long time. I don't mean that strictly in terms of how good he looks (although he is quite pleasing to the eye) but rather in terms of how different he looks to his mold-brother. Even though the colour layouts and deco pattern aren't that different, the colours Skullgrin uses are so wildly different from Straxus that he's clearly his own entity. His chest and arms are split between maroon and black, aside from his white fingers and the light-grey tracks that are attached to Skullgrin's arms like bracers. 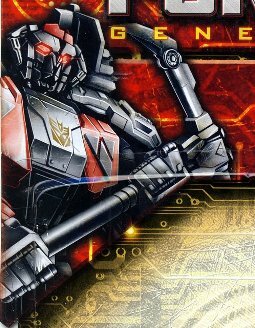 A pale gold Decepticon badge is painted on the centre of his chest, and silver triangles adorn his massive pectorals. He's got light grey shoulder pads and 'backpack' kibble, the latter of which is made up of his tank treads. His thighs, which are very small proportionally to the rest of his body, are black with painted silver detail while his lower legs are light grey with maroon and gold painted highlights. Skullgrin features a new head design, a stylized, mechanized version of his Pretender shell's goat-skull head that replaces Straxus's soulless executioner's hood. 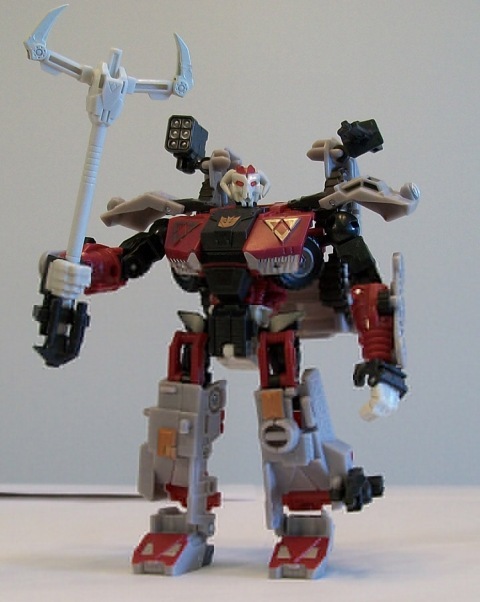 The new head's resemblance to either Skullgrin's toy or his Marvel character model is vague at best, but because he's the only Transformer out there with a demonic goat head for a face you're not going to mistake him for anyone else. Like the head, the rest of Skullgrin only vaguely resembles the original. The Straxus toy's big, beefy proportions give him a similar silhouette to his Pretender shell (and especially to the Marvel version of the design) but that's where the resemblance ends. His colours are laid out completely differently, with the exception of his chest, which resembles the chest of his old toy's inner robot. The colour selections are very different too. The dark maroon is different from both the original figure's pink and the comic model's purple, and the flat, medium grey used on the original has been switched out in favour of several shades of grey and black. The end result doesn't look a thing like Skullgrin...except it does and I really can't say why. I realize that's not especially helpful, and I'm sorry for that. The closest I can come to making sense, even to myself, is that the new figure manages to 'feel' like Skullgrin even though it doesn't necessarily look a lot like him. In spite of his bulk, Skullgrin is actually very posable. He's got six points of articulation on each arm, four on each leg, a rotating waist and a ball-jointed (if not especially mobile) neck. One point of interest is that Skullgrin's neck joint is actually assembled backwards compared to Straxus. It doesn't seem to cause any problems as far as mobility goes and you can barely see it, which is a good thing because you would probably have to disassemble his entire chest in order to fix it. In spite of being very top-heavy, Skullgrin has very good balance and doesn't seem to have much trouble standing even in poses that should by all rights send him toppling on his face. Arguably the best thing about this toy, however, are the weapons. 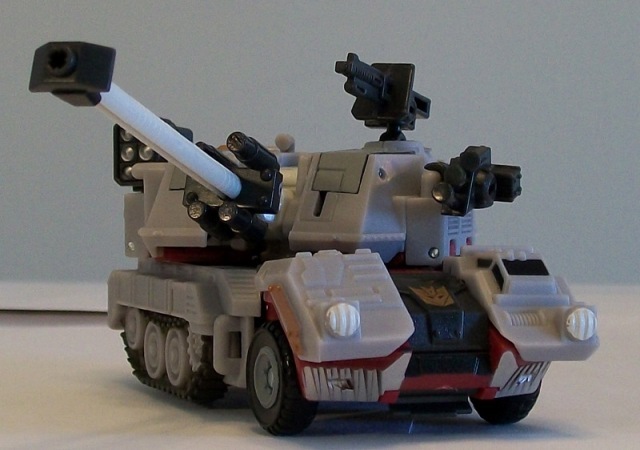 In addition to the clip-weapons that I mentioned in the vehicle mode review (which can mount on numerous different places in robot mode as well) Skullgrin's tank barrel becomes his primary weapon in robot mode. The weapon was designed to transform into a pickaxe that resembled Straxus's primary weapon from the Marvel comics, and while that's certainly a decent weapon in it's own right it doesn't seem very 'Skullgrinny' to me. Luckily, though, the weapon is versatile enough to be repurposed as other things. With the blades of the pick pointed upward it becomes a serviceable pitchfork, and it can also be held by the business end of the pickaxe for use as a rifle. If none of those things appeal to you it can be stored on his back and kept out of the way. 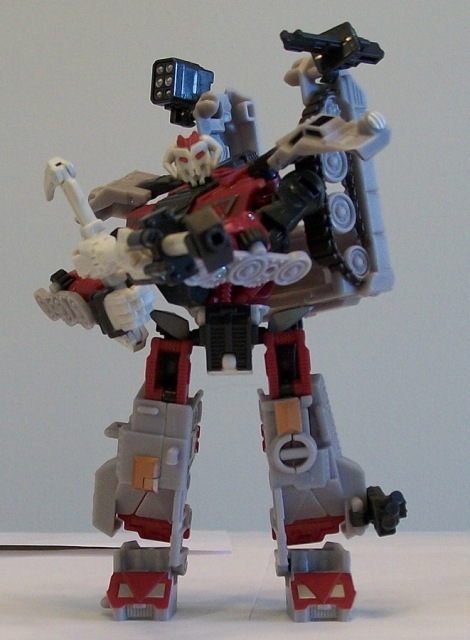 Another neat feature, if you've got the original Skullgrin, is that this guy can use the original toy's weapons. I don't have them myself, but I like the look of that combination in the pictures I've seen. Even though he's not a slavish homage to the original, Skullgrin's robot mode is a very nice toy in its' own right.